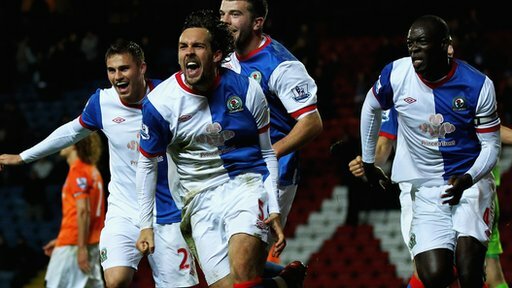 Gael Givet's extra-time header put Blackburn through to the Carling Cup last eight at the expense of Newcastle. Rovers took an early lead when Ruben Rochina blasted in from 12 yards before Yakubu doubled the lead from the spot in the second-half. Injury-time strikes from Danny Guthrie and Yohan Cabaye forced extra time. Morten Gamst Pedersen scored a free-kick, Peter Lovenkrands' penalty levelled from the spot before Givet popped up with the late winner. Towards the end of normal time it looked as though Blackburn were certain to reach the quarter-finals for the fourth time in five seasons, but in-form Newcastle were not going to give up their unbeaten start to the season easily and stunned the home fans with their late double. Alan Pardew's side came into the game with an 11-game undefeated run in all competitions, which sees them sitting level with Chelsea in the Premier League - 14 points ahead of rock-bottom Rovers, who have won just one league game so far. Blackburn fans protested before their last two home games, demanding the dismissal of boss Steve Kean, but this battling performance may appease some of the unhappy supporters. Rochina set Blackburn off to a flying start with a fifth-minute strike after Martin Olsson broke down the wing before pulling the ball back into the path of the Spaniard, who struck from 12 yards. Newcastle thought they had a penalty after the restart when Christopher Samba appeared to bring down Demba Ba in the area, but it was at the other end that a spot kick was awarded when keeper Tim Krul upended Rochina in the area after 64 minutes and Yakubu calmly slotted home. But just as Rovers were poised to celebrate their first victory over Premier League opposition in the Carling Cup since 2009, the visitors staged a late comeback when Guthrie scored from 25 yards in the 93rd minute after the Rovers defence backed off. And in the sixth minute of stoppage time Cabaye forced extra-time when he hit a 20-yard free kick after Samba fouled substitute Lovenkrands. Blackburn were back in front nine minutes into extra time thanks to Pedersen's 35-yard free-kick, which took a deflection off the Newcastle wall before flying past Krul. However, Newcastle were soon on level terms once more when Cabaye was deemed to have been pulled back in the area by the assistant referee and Lovenkrands stepped up to put away the resulting spot kick. Just as penalties looked to be on the cards, Pedersen swung in a free-kick that Samba headed back across the goal for Givet to head home from just a yard out with the Newcastle defence appealing for offside. "Gael Givet encapsulates the whole spirit we have got here - he had a hamstring nick but would not come off. He's a warrior, he has put his head where other people wouldn't put their feet. He was fantastic. "It's tough mentally when they scored so late to go and score again but we did it. "We are always going to score goals but we have been working day in, day out defensively so that when we lose possession we get a good shape." "I don't like the tag of gallant losers but it was a fantastic effort and the fans would have appreciated the effort we have put in. "Some times events just go against you and events certainly did tonight. But the players don't know when to give in, we kept going and two great hits got us back into the game, but tiredness cost us at the end. "If we are going to go out of the cup that's how it should be - giving it everything." 120:00+2:19 The match has finished after extra time. 119:19 Assist by Christopher Samba. 119:19 GOAL - Gael Givet:Blackburn 4 - 3 Newcastle Gael Givet grabs a headed goal from inside the six-yard box. Blackburn 4-3 Newcastle. 118:43 Free kick awarded for a foul by Fabricio Coloccini on David Goodwillie. Morten Gamst Pedersen restarts play with the free kick. 118:19 Free kick awarded for an unfair challenge on Grant Hanley by Sammy Ameobi. Mark Bunn takes the direct free kick. 116:14 Shot from just outside the box by David Goodwillie misses to the left of the target. 113:12 Booking Martin Olsson is given a yellow card. 112:46 Unfair challenge on Davide Santon by Simon Vukcevic results in a free kick. Tim Krul takes the direct free kick. 108:24 Corner taken left-footed by Morten Gamst Pedersen, save by Tim Krul. 107:45 Booking Danny Guthrie receives a yellow card. 107:37 Danny Guthrie challenges Mauro Formica unfairly and gives away a free kick. Direct free kick taken by Mark Bunn. 106:35 Fabricio Coloccini fouled by Simon Vukcevic, the ref awards a free kick. Tim Krul takes the free kick. 105:56 Demba Ba takes a shot. Blocked by Christopher Samba. 105:01 The referee starts the second half of extra time. 105:00+2:38 David Goodwillie takes a shot from long distance which goes wide right of the goal. 105:00+2:04 GOAL - Peter Lovenkrands:Blackburn 3 - 3 Newcastle Placed penalty scored by Peter Lovenkrands. Blackburn 3-3 Newcastle. 105:00+1:34 Grant Hanley gives away a Penalty for an unfair challenge on Peter Lovenkrands. 105:00+0:31 Demba Ba takes a shot. Save by Mark Bunn. 104:36 David Goodwillie is ruled offside. Free kick taken by Tim Krul. 102:12 Jonas Gutierrez fouled by Grant Hanley, the ref awards a free kick. Shot on goal comes in from Danny Guthrie from the free kick, save by Tim Krul. 100:40 Mauro Formica takes a shot from a long way out which goes wide of the right-hand upright. 98:37 GOAL - Morten Gamst Pedersen:Blackburn 3 - 2 Newcastle Morten Gamst Pedersen scores a goal direct from the free kick from long range to the bottom right corner of the goal. Blackburn 3-2 Newcastle. 97:53 Free kick awarded for a foul by Fabricio Coloccini on Gael Givet. 97:24 Davide Santon gives away a free kick for an unfair challenge on David Goodwillie. Free kick taken by Martin Olsson. 96:57 Jonas Gutierrez sends in a cross. 94:34 Davide Santon challenges Mauro Formica unfairly and gives away a free kick. Free kick taken by Morten Gamst Pedersen. 93:40 The ball is sent over by Gabriel Obertan, blocked by Christopher Samba. Outswinging corner taken right-footed by Yohan Cabaye played to the near post, clearance by Morten Gamst Pedersen. 92:16 Shot from just outside the penalty area by Demba Ba misses to the left of the target. 90:00+8:12 The whistle goes for the end of normal time. 90:00+6:51 The final whistle is blown by the referee. 90:00+5:34 GOAL - Yohan Cabaye:Blackburn 2 - 2 Newcastle Free kick scored by Yohan Cabaye from long range to the top left corner of the goal. Blackburn 2-2 Newcastle. 90:00+4:37 Foul by Christopher Samba on Peter Lovenkrands, free kick awarded. 90:00+2:30 Gabriel Obertan provided the assist for the goal. 90:00+2:30 GOAL - Danny Guthrie:Blackburn 2 - 1 Newcastle Danny Guthrie fires in a goal from long distance to the bottom left corner of the goal. Blackburn 2-1 Newcastle. 90:00+1:05 The ball is crossed by Gabriel Obertan, Morten Gamst Pedersen manages to make a clearance. 86:43 Substitution Grant Hanley joins the action as a substitute, replacing David Hoilett. 86:43 James Perch concedes a free kick for a foul on David Goodwillie. Morten Gamst Pedersen takes the free kick. 84:26 Outswinging corner taken by Yohan Cabaye, Shot by Yohan Cabaye from deep inside the penalty area misses wide to the left of the target. 83:15 Booking David Hoilett receives a yellow card for unsporting behaviour. 83:01 Sammy Ameobi fouled by David Hoilett, the ref awards a free kick. Yohan Cabaye takes the free kick. 80:14 Unfair challenge on Simon Vukcevic by Demba Ba results in a free kick. Direct free kick taken by Mark Bunn. 78:46 Morten Gamst Pedersen is penalised for handball and concedes a free kick. Free kick taken by Yohan Cabaye. 78:08 Substitution (Newcastle) makes a substitution, with Peter Lovenkrands coming on for Hatem Ben Arfa. 77:09 Substitution Simon Vukcevic replaces Ruben Rochina. 76:27 Substitution Gabriel Obertan on for Sylvain Marveaux. 74:36 Sammy Ameobi produces a right-footed shot from the edge of the box and misses to the right of the goal. 73:22 Sammy Ameobi sends in a cross, Christopher Samba gets a block in. Corner taken by Yohan Cabaye played to the near post. 72:11 The offside flag is raised against David Goodwillie. Direct free kick taken by Tim Krul. 71:35 The ball is swung over by Sammy Ameobi, clearance made by Christopher Samba. 70:03 Effort from the edge of the box by Martin Olsson goes wide of the right-hand upright. 69:23 Substitution Sammy Ameobi on for Danny Simpson. 67:42 Free kick awarded for a foul by Demba Ba on Gael Givet. Mark Bunn restarts play with the free kick. 67:23 David Hoilett gives away a free kick for an unfair challenge on Danny Simpson. Danny Guthrie takes the direct free kick. 65:59 Substitution Mauro Formica comes on in place of Ayegbeni Yakubu. 65:50 Jonas Gutierrez sends in a cross. 63:40 GOAL - Ayegbeni Yakubu:Blackburn 2 - 0 Newcastle Penalty taken left-footed by Ayegbeni Yakubu and scored. Blackburn 2-0 Newcastle. 62:43 Booking The referee shows Tim Krul a yellow card for unsporting behaviour. 62:23 Tim Krul challenges Ruben Rochina unfairly and gives away a Penalty. 60:46 Morten Gamst Pedersen concedes a free kick for a foul on Hatem Ben Arfa. Direct free kick taken by Hatem Ben Arfa. 60:25 Ayegbeni Yakubu takes a shot. Save by Tim Krul. 59:44 David Hoilett challenges Sylvain Marveaux unfairly and gives away a free kick. Tim Krul takes the direct free kick. 55:42 The offside flag is raised against Jonas Gutierrez. Mark Bunn takes the free kick. 54:00 The assistant referee flags for offside against Ayegbeni Yakubu. Tim Krul takes the free kick. 52:38 Headed effort from inside the area by Sylvain Marveaux misses to the right of the target. 50:35 Danny Simpson challenges Ayegbeni Yakubu unfairly and gives away a free kick. David Hoilett produces a shot on goal direct from the free kick, save made by Tim Krul. 49:23 Corner from the left by-line taken by Morten Gamst Pedersen, Ayegbeni Yakubu gives away a free kick for an unfair challenge on Tim Krul. Free kick taken by Tim Krul. 48:21 Yohan Cabaye takes the inswinging corner, Yohan Cabaye has a headed effort from close range and clears the bar. 47:04 David Goodwillie takes a shot. Save by Tim Krul. 45:59 The ball is swung over by Martin Olsson, James Perch makes a clearance. 45:00+1:36 The referee calls an end to the first half. 45:00+0:58 Ayegbeni Yakubu takes a shot. Save by Tim Krul. 44:36 Morten Gamst Pedersen challenges Sylvain Marveaux unfairly and gives away a free kick. Direct free kick taken by Tim Krul. 41:38 Morten Gamst Pedersen shoots direct from the free kick, save made by Tim Krul. 41:38 Booking Fabricio Coloccini goes into the book for unsporting behaviour. 40:55 Unfair challenge on Ayegbeni Yakubu by Fabricio Coloccini results in a free kick. 39:51 Morten Gamst Pedersen fouled by Hatem Ben Arfa, the ref awards a free kick. Mark Bunn takes the direct free kick. 38:49 Fabricio Coloccini is adjudged to have handled the ball. Morten Gamst Pedersen takes the direct free kick. 37:50 Foul by David Goodwillie on Danny Guthrie, free kick awarded. Free kick taken by James Perch. 35:07 Christopher Samba gives away a free kick for an unfair challenge on Demba Ba. Danny Guthrie takes the free kick. 34:04 David Goodwillie gives away a free kick for an unfair challenge on James Perch. Danny Simpson takes the free kick. 32:49 Corner taken by Yohan Cabaye from the right by-line, Effort from the edge of the box by Danny Guthrie goes wide of the left-hand upright. 30:42 Unfair challenge on David Goodwillie by James Perch results in a free kick. Morten Gamst Pedersen shoots direct from the free kick, save by Tim Krul. 25:58 The ball is swung over by Danny Guthrie, Christopher Samba makes a clearance. 25:15 Free kick awarded for an unfair challenge on Demba Ba by Radosav Petrovic. Yohan Cabaye restarts play with the free kick. 23:53 Free kick awarded for a foul by Yohan Cabaye on David Hoilett. David Hoilett takes the free kick. 23:30 Ruben Rochina takes a shot. Save by Tim Krul. 21:03 Outswinging corner taken left-footed by Morten Gamst Pedersen, save by Tim Krul. 18:56 Free kick awarded for a foul by Yohan Cabaye on Ruben Rochina. Strike on goal comes in from Morten Gamst Pedersen from the free kick, Tim Krul makes a save. 14:10 Ayegbeni Yakubu takes a shot. Blocked by James Perch. Inswinging corner taken by Morten Gamst Pedersen from the left by-line. The referee blows for offside against David Goodwillie. Danny Simpson takes the free kick. Correction - 11:27 The official flags David Hoilett offside. Tim Krul takes the free kick. 11:27 The referee blows for offside against David Hoilett. Direct free kick taken by Tim Krul. Correction - 9:22 David Goodwillie takes a shot. Tim Krul makes a save. 9:22 David Goodwillie takes a shot. Save by Tim Krul. 8:38 The referee blows for offside against Demba Ba. Free kick taken by Mark Bunn. 7:26 Effort from inside the area by Demba Ba bounces off the post. 5:32 Jonas Gutierrez gives away a free kick for an unfair challenge on Ruben Rochina. Free kick taken by Jason Lowe. 4:20 Assist on the goal came from Martin Olsson. 4:20 GOAL - Ruben Rochina:Blackburn 1 - 0 Newcastle Ruben Rochina gets on the score sheet with a goal from deep inside the penalty box to the top right corner of the goal. Blackburn 1-0 Newcastle. 3:42 The official flags Danny Simpson offside. Direct free kick taken by Mark Bunn. 3:19 Free kick awarded for a foul by Morten Gamst Pedersen on Yohan Cabaye. Free kick taken by Davide Santon. 2:54 Free kick awarded for an unfair challenge on Davide Santon by Ruben Rochina. Free kick taken by Davide Santon. 2:06 Ruben Rochina takes a shot. Blocked by Fabricio Coloccini.